TacStar continues their position as a leader in top quality, high tech shotgun accessories with the introduction of Carbon Fiber magazine extensions. Carbon fiber offers an unbeatable strength to weight ratio. These extensions are about 4 times lighter than traditional steel tubes, however they are much stronger. 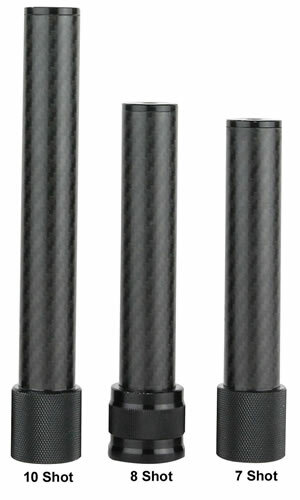 The carbon fiber offers durability and toughness to go along with light weight, making it the perfect material for extension tubes. The Tac 1081501 Carbon Fiber 8 Shot extension seems to work great it fit my gun very well and with the barrel clamp it is very secure. I did opt for a different spring the one that came with the extension was a little short and I wanted a stiffer spring. I bought a Nordic heavy spring which was only $11 and it cycles very strongly and it is very positive in loading. The guide block is beveled very well and slides with no problems in the tube. Love It! !